Simon Gagne is currently a free agent, but is likely to return to Philadelphia next season. When a team misses the playoffs, chances are some players get traded, released, or bought out. When that team is the Philadelphia Flyers, all hell tends to break loose. Flyers owner Ed Snider and General Manager Paul Holmgren are well known for their lack of patience and have made many controversial moves over the years to improve the Flyers’ chances of raising the Stanley Cup. In 2011, after losing in the second round of the playoffs, Holmgren traded captain Mike Richards and leading scorer Jeff Carter away for several young players and draft picks. The Flyers signed “superstar” goalie Ilya Bryzgalov to a nine year deal to secure their shaky goaltending position. The result: Carter and Richards (and former Flyer Simon Gagne) won the Stanley Cup with Los Angeles, and the Flyers lost again in the second round, though this time with a perplexing and slightly absurd character between the pipes (see: Bear in Woods, the Universe speeches). The lockout-shortened 2013 NHL season was not friendly to the Flyers, who missed the playoffs for the first time since 2007. Multiple injuries plagued Philadelphia’s blue line, and the Flyers’ goaltending questions continued (thanks to whoever traded away 2013 Vezina Trophy winner Sergei Bobrovsky). Now, under the newly ratified collective bargaining agreement, the NHL salary cap for the 2013-14 season stands at $64.3 million. As of today, the Flyers’ cap payroll stands at $7.8 million over the limit. That means Philadelphia will have to make some moves this offseason to avoid hefty cap penalties from the NHL. Here’s what could happen in the days and weeks ahead. Sources close to the Flyers reported that the Flyers agreed to a four-year, $21.5 million deal with 35-year-old defenseman Mark Streit. However, Flyers management claims they are still negotiating with the veteran blueliner and no deal has been confirmed. Streit scored 27 points in 48 games last year for the Islanders, where he also served as captain for two years. Streit is known as an offensive defender, a player who can move the puck well and score points while still providing a strong body on the blueline. It’s an interesting move that solidifies the holes left in the blueline by past injuries (and Chris Pronger’s concussion), but at 35, Streit could be more susceptible to injury and decreased productivity. A risky move by Paul Holmgren to replace Pronger. The Flyers will primarily have to find another goaltender to complement Steve Mason. A popular name is Los Angeles’ Jonathan Bernier, who turns 25 in August. He has proven he can play, saving 91 % of shots in his young NHL career, but could struggle to play behind Conn Smythe winner Jonathan Quick in LA. Bernier would be another young player the Flyers could develop, and could team with Steve Mason to develop a formidable goaltending platoon. Then the Flyers need to find some third and fourth line players to replace outgoing players. 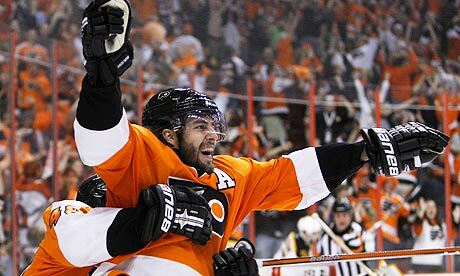 Simon Gagne has said he would take a pay cut to remain in Philadelphia, and he would be a valuable asset to the Flyers. Mike Knuble could also re-sign, but at a discounted price. On the defensive side, Erik Gustaffson and Mat Walker would be great young players to re-sign. The bottom line is, the Philadelphia Flyers have to make some moves this summer to rebuild a team that can win a Stanley Cup. Head Coach Peter Laviolette will return, and the new-look Flyers will hope to bring the Stanley Cup back to the City of Brotherly Love for the first time in 39 years.